A pair of ten-year-olds find an abandoned cop car in a field. When they take it for a joyride, it seems like they could kill themselves at any moment. But things only get worse when the small town sheriff goes looking for his missing car. The kids find themselves in the center of a deadly game of cat and mouse they don’t understand and the only way out is to go as fast as their cop car can take them. A small town sheriff sets out to find the two kids who have taken his car on a joy ride. Download Cop Car in Digital HD from the iTunes store. Cop Car images are © Focus World. All Rights Reserved. Director Kevin Smith once said that the golden age of independent films has left us, and what we are left with is just big studio films created by a committee. Most days, I hold to these truths. However, once in a while, a film comes along that throws caution to the wind and surprises you. Cop Car, written and directed by Jon Watts (director of the upcoming Spider-Man reboot), is a simple story. Corrupt Sheriff Kretzer's (Kevin Bacon; The Following, Black Mass) "cop car" has been taken for a joy ride by two young boys, Travis (James Freedson-Jackson) and Harrison (Hays Wellford), who found it left unattended in the woods. Frantic to get his car back before anyone discovers, Kretzer mounts his own man-hunt to find his car and recover his property. From reading this over simplistic plot one might quickly discard this movie and not give it chance. However, one would be making a grave error in doing this. In true Quentin Tarantino style, the movie starts very slowly, using mostly dialog and making the audience do some work putting some of the pieces of the puzzle together. Then, over the course of the film, the audience starts to have a love/hate relationship with all of the characters in the film. One might feel sorry that Sheriff Kretzer has had this unfortunate theft happen to him, or maybe that the boys are not too bright in the head and should start to take responsibility for the actions. Either way, you will start to get vested in the movie. It is from this point on that director Watts has you, and without missing a beat, turns the entire wold of Cop Car upside-down. All the tension that has been slowly mounting for the entire film is finally unleashed in the final fifteen minutes on screen in such a brazen fashion that you can't even comprehend how the film got there. Small independent films usually rely on good old-fashioned acting to tell their story, rather than big explosions and flying superheroes, and Cop Car perfectly fits in this category. The two relative newcomers, James Freedson-Jackson and Hays Wellford, have strong on-screen personas that rival, I dare say, a lot of adult actors in the industry today. The two kids were tasked with carrying about 60 percent of the film on their shoulders and do an amazing job. 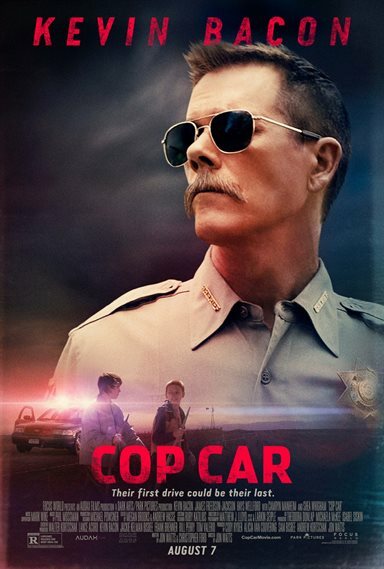 Of course, the biggest draw to get people to see Cop Car is leading man Kevin Bacon, who does not disappoint. In this film, he truly shows his acting chops and why he has been a leading man since the 1980s. Presented in 1080p, Universal's transfer of Cop Car is gorgeous. The picture is sharp and crisp with spot on black levels. The colors are natural and no artifacting can be found through the entire presentation. While the DTS-HD Master Audio 5.1 lossless soundtrack is not overly complex, the dialog and the background noise of the open road is quite clear, as well as the violent end of the film, which perfectly fill the surround sound speakers of your home theater system. 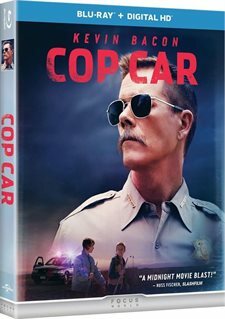 One very glaring and very disappointing feature of the Cop Car Blu-ray release the lack of special features, save a very short three minute "making of" featurette. While I did not expect to find a music video, gag reel, or other fluff pieces normally on Blu-ray releases, I did hope to find a deeper insight into the making of this film, as well as the thought process that went into making it, and was heartbroken when this was not the case. Overall, Cop Car is a very good piece of independent filmmaking and is a nice change of pace from the "safe bets" studios usually flood the theater and home theater market with. It is nice to see Kevin Bacon taking a break from mainstream films to create a picture such as this. It was also a joy for me to experience a film that actually held my interest longer than the latest explosion on screen and had me vested in the characters long after their scene played out. One can only hope that Watts continues this type of quality filmmaking with his Spider-Man reboot in 2017.